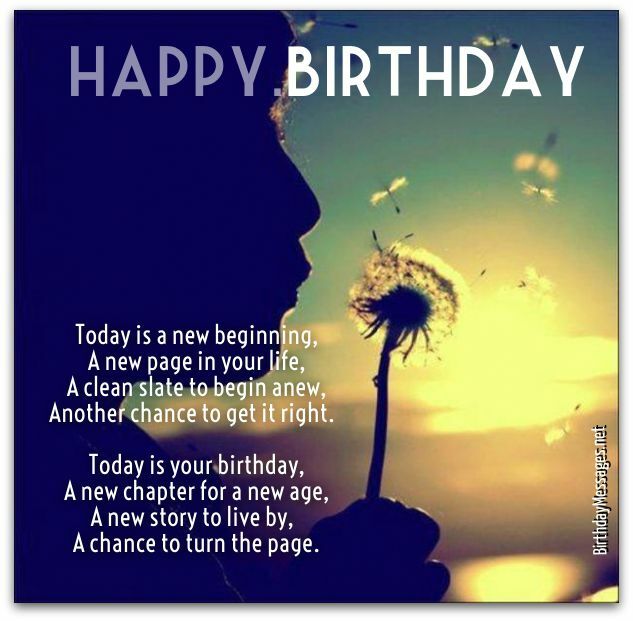 Inspirational birthday poems, like the unique poems for birthdays on this page, are a very powerful, very personal way to inspire the ones you love on their birthday. Although inspirational poetry is one of the easiest ways to inspire the people you love (and possibly change their lives), you still need to choose the right one to pull off both. 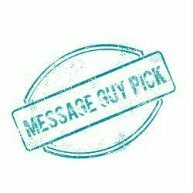 If you would like to glance at some tips on choosing the perfect poem, take a quick look at Message Guy Tip #96 (just below). Yep, it's that simple. One of the greatest gifts you can give your loved ones on their birthday is the gift of inspiration. Words that stir the soul or move mountains can have a profound effect on someone special, especially on the day of their birth and particularly in a poem. These messages can easily translate into inspirational birthday poems. All you need to do is choose a poem with a theme that matches one of the messages above, a message you want to send to someone special. If the birthday boy or girl is a very proud person but still needs some inspiration, choose a very subtle inspirational poem (less-than-subtle inspirational birthday poems might seem patronizing to this loved one). If the birthday boy or girl lacks drive and needs a little push to do something that will lead to a considerably better quality of life, opt for more assertive inspirational birthday poems. If the birthday boy or girl is very insecure, go for a highly positive, slightly subtle inspirational birthday poem (so you won't add insult to injury). If the birthday boy or girl is totally oblivious to what he/she needs to do in life, select an assertive inspirational birthday poem. Since most people love inspirational messages, there's really no need to consider if inspirational birthday poems are right for your loved ones. If you're not convinced of this fact, click here to read Why we love inspirational quotes, an article I found the other day. Essentially, we love them (and probably your family and friends love them too) because we love ideas (the ideas we find in inspirational messages) that give birth to other ideas (our own ideas). This is my birthday wish for you. I like this poem because it redefines the meaning of true success, inspiring us to be better than we are, reach beyond ourselves and truly help our fellow man, woman and child. This is the type of inspiration that many of us need to reach our full potential as human beings. This is what real success is all about. What a wonderful message to give someone on their birthday. 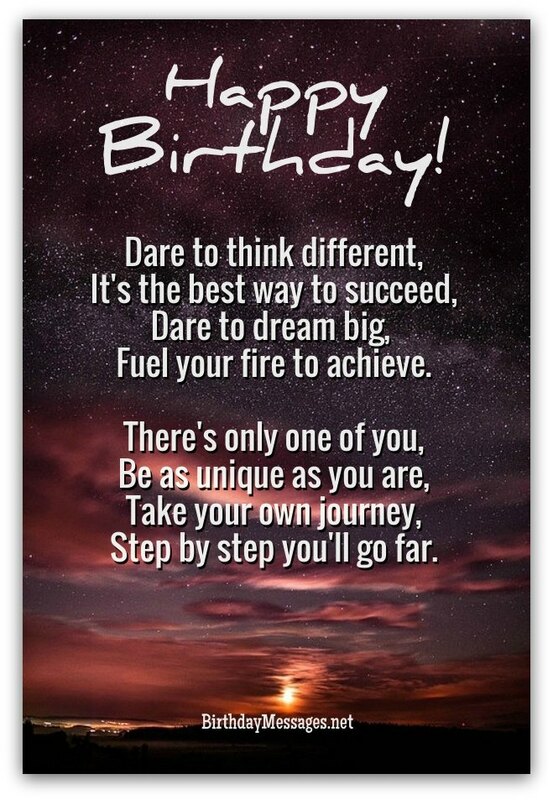 If you would like to add a personal birthday wish to this inspiration birthday poem, you could use the this one: May you know this success on your special day. Happy birthday. "To laugh often and much. Fuel your fire to achieve. Step by step you'll go far. In a poem, this message is more palatable and, in the case of this birthday poem, quite uplifting. In fact, I would even say that this is one of those inspirational birthday poems that can truly motivate people to carry on. 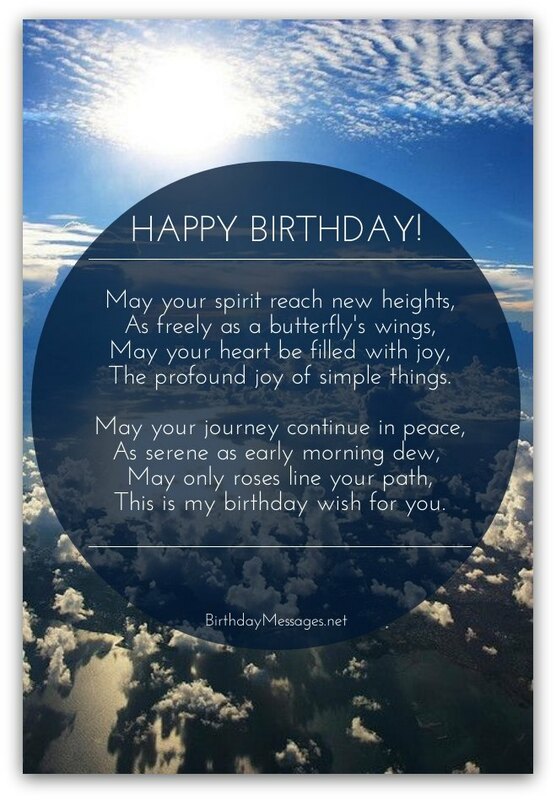 If you would like to add a personal birthday wish to this inspiration birthday poem, I would use a simple one that does not preach to the birthday boy or girl: This is my birthday wish for you. Happy birthday. And you want to smile. You can pierce the sky. As long as you take flight. This poem is straight to the point. Its message is relatively simple: if you think you'll never accomplish anything worthwhile, you won't. Your destiny, in other words, depends on what you think. Do you know anyone who could benefit from this straightforward point of view? I do. I find that this poem works best with people who have certain gifts but don't realize they have them or believe that they don't have them, which pretty much leads to the same conclusion: I won't even try to use my gifts, because I will fail. "Thinking" by Walter D. Wintle is one of those inspirational birthday poems that can cut through all the walls people build to make sure they never fail (or even try) and, along the way, can provide the reader with some hope for success. This is a winner as an inspirational birthday poem. If you would like to add a personal birthday wish to this birthday poem, you could use the this one: I think you're a winner. I know you can win at anything. Happy birthday. Before you can ever win the prize. The ones who think they can." A chance to turn the page. This poem by Donna Levine talks about our potential. We all have the potential to do something great. According to most religions, that potential is actually our mission in life. You might say it's our raison d'etre (our reason to be). Psychologists and philosophers refer to it as "our purpose" in life. Whatever you call it, we all have it...and this poem packages this ea in a way that is very uplifting. There are some loved ones in our lives who have potential but lack the confidence to fulfill it. Giving these special people this poem is a kind, loving way to remind them that they can do anything with their lives. In other words, you would be giving them the gift of hope with this poem. What an amazing gift to give someone you love on their birthday. Want to add a personalized birthday wish to this birthday poem? I have the perfect one right here: I know you can be whatever you want to be, because you have the courage to fulfill your potential. Happy birthday. And to hold on to your dream." And fill our lives with endless cheer. And see your gift through our eyes. "The Road Not taken" by Robert Frost hits upon a number of universal themes that run through every life of every person on Earth: being true to yourself, thinking differently, choice, risk, conformity, you name it. And it intertwines every theme so seamlessly, to the extent that it's quite difficult to separate one from another, making this poem all the more approachable to any reader. So many people can benefit from this poem. 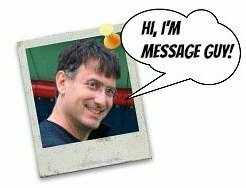 It has an uplifting message for everyone who reads it. This has to be one of the best inspirational birthday poems of all time. Adding a heartfelt birthday wish to this birthday poem would be a great idea. I have one you could use right here: May you always take the road to true joy and wonder. Happy birthday. And "Happy Birthdays" ever after.